Whether you want to experiment with companion planting, pest control or simply need some plants to do the work for you, gardening in harmony with nature has never been easier. Get the best out of your outside space by calling on your garden "friends." Introducing helpful wildlife into your garden will help to control pests, maintain a natural chemical-free balance and encourage your garden to bloom, whether you have a large garden, an allotment or a simple window box. Some plants are great "friends" and are endlessly useful—sweetpeas are good for regenerating tired soil, for example, while marigolds repel pesky greenfly away from your prized cabbages. Birds and other animals such as hedgehogs, bats and frogs are also renowned pest-munchers, while bees, butterflies and other insects will happily pollinate your flowers, fruit and vegetables. Encouraging just a few of these "friends" into your garden will soon ensure your prized plants are blooming. This practical guide describes all of the wonderful wildlife that is helpful to have in your garden and how to spot them. 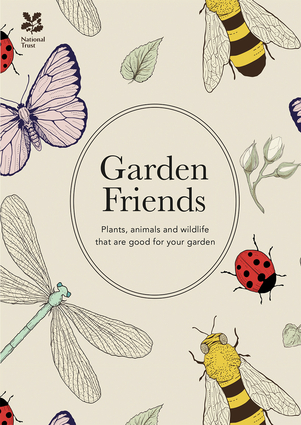 Packed with hints and tips on how to encourage the critters into your space and make sure they stick around, this guide is a must-have for any gardener. Ed Ikin is the General Manager of Morden Hall Park, Rainham Hall and London Residential National Trust gardens. He is one of their most innovative and energetic gardeners. He is the author of Thoughtful Gardening and was a contributor to Gardening Secrets and The Good Gardener.